Minor tweak or radical redesign? 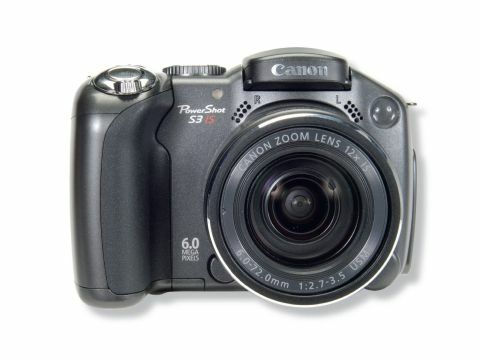 Going grey is a sign of ageing but the PowerShot S3 IS wears it very well, trading in the ubiquitous silver of its predecessor for a much more classy looking gunmetal grey finish. But this is more than just a makeover; there are some important improvements in the feature list too, including a new 6Mp sensor that replaces the old 5Mp CCD, and a larger 2.0-inch LCD, although even this is less than average compared with most new cameras. Better news on the LCD front is that Canon has retained the pull out, flip-over and swivel design for viewing from almost any angle. Build quality and design are very good. The camera feels very natural in the hand and combines a wealth of serious photographic controls with a simple menu and control system that, for the most part, is very logical and intuitive. There are a couple of niggles, like the fact that we had to resort to the advanced user guide, which is only available on CD rather than being printed, to explain one particular arcane icon on the LCD. As it turned out, it was the icon for the wind noise reduction system for the microphone, which is turned on by default, even though it's only really useful when you're shooting movie clips. The only thing that spoilt the build quality a little from our point of view is that our review sample seemed to have a very slightly loose top plate, which creaked every time we pressed down on the power button to switch off the camera. Most importantly, digital cameras should be fun, and this is something that the S3 IS has in spades. So many digital compacts seem to sell you short, at least in terms of the zoom department, but the Canon's 12x optical zoom lens gives a colossal range equivalent to 36-432mm in 35mm-speak. So while the wide-angle is only average, the telephoto opportunities abound. The reasonably fast f/2.7 to f/3.5 maximum aperture means that you can, to some extent, isolate objects against blurred backgrounds by using a fairly narrow depth of field. However, as with other compact super-zoom cameras, it doesn't hold a candle to a D-SLR in this respect. Naturally, one of the biggest problems with using a long telephoto lens is camera shake. The S3 IS scores well here with an excellent optical image stabiliser built into the lens, allowing you to select from three different modes for always on, shot only and panning, as well as the option to turn the IS off altogether. In our tests, image stabilisation worked extremely well; whether shooting static targets in low lighting conditions, or panning for moving wildlife and sports action shots (see this issue's super-zoom group test on page 18). The camera's photo-friendly features include a full complement of programme, aperture-priority, shutter-priority and manual exposure modes. They're all very intuitive and exposure adjustments are quick and easy using a four-way thumb pad on the camera's back plate. So often, cameras that offer these kind of facilities, enabling the camera to grow with you as you learn, bury the adjustments away, making them too slow and rather cumbersome to use when you're hurrying to get a shot. The Canon is exemplary in this respect, as well as offering quick access to ISO settings, manual focus, flash and scene mode selection. There's also a one-touch button for switching to movie mode, which works beautifully for capturing wildlife or sports sequences using that powerful zoom lens. The S3 IS doesn't have a hot shoe but Canon offers a separate high-power flash as an optional extra. You can also extend the range of its generous lens with optional 0.75x wide-angle and 1.5x telephoto converters, practically turning the camera into a mini SLR. Our only gripe is that the viewfinder is a little small, although it offers refreshingly fluid panning. Most importantly, the test shots from this camera were consistently stunning. For natural and vivid colour, as well as skin tones, colour rendition was lively but beautifully accurate.